The University of Illinois at Chicago and Credit Union 1 have reached an agreement in principle that would grant naming rights to the UIC Pavilion. 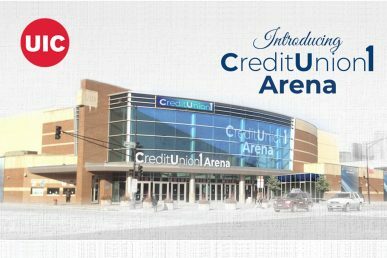 Under the terms of the agreement, which remains subject to review and approval by The Board of Trustees of the University of Illinois, the facility will be renamed Credit Union 1 Arena. Currently, the UIC Pavilion is a 9,500-seat multi-purpose arena in the heart of UIC’s thriving campus. It is where UIC students both begin and conclude their time on campus as the site of Convocation and Commencement. The building also hosts athletic events, including boxing, UIC men’s and women’s basketball games, concerts, special events and more. The UIC men’s basketball team will host William & Mary on Thursday, Nov. 15, in the first event to recognize the reinforced partnership between Credit Union 1 and UIC. The partnership will be celebrated, again, on Saturday, Dec. 1, when the Flames host the Loyola Ramblers at 3:12 p.m. CST.